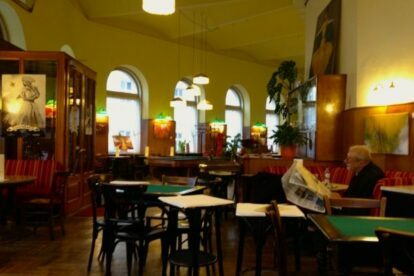 Located near to the Währinger Straße U6 station (40, 41, 42 trams) and close to the city’s main hospital, this quintessentially Viennese coffee house conforms entirely to type. Like Sperl on Gumpendorfer Straße, it even has a pocketless billiards table (no, I don’t get it either). The décor is Jugendstil, a style replicated in many classic cafes in Vienna. The waiters are impeccably turned out and you are likely to see an older clientèle reading newspapers. It’s not all tradition though: there is, at times, live music performed here. There’s also the option of Wi-Fi, provided by Freewave, which is easy to navigate and you can stay logged on for two hours. The coffee here is predictably excellent and so is the food. I recommend, in particular, a dish called Geröstete Knödel mit Ei. It is a sort of omelette with fried breaded dumplings and served with salad. I particularly like the Schopenhauer interpretation as it is served with dill, and the salad dressing is tangy without being bitter. In addition, there is the standard coffee house fare of cake, which always looks as wonderful as it tastes. But the selling point, and my real reason for visiting, is the lunchtime menu; € 7.30 will get you a soup and main course and it’s almost always excellent. Undoubtedly a jewel which, although it is out in the 18th district, is not far enough from the city centre to discourage a visit.